The US is determined to eliminate trans fatty acids from its food. Can India do the same? The US Food and Drug Administration (FDA) announced on November 7, 2013, that it intends to declare artificial trans fatty acids (TFAs) as not “generally recognised as safe” for consumption. The country is set to eliminate industrially produced TFAs. Their use would be illegal unless approved by FDA. America’s food regulatory agency has announced a 60-day comment period ending on January 5, 2014, before it takes a final decision. FDA commissioner Margaret Hamburg said in a press release that the step can save at least 7,000 lives and prevent up to 20,000 heart attacks every year. In 2003 the Centre for Science in the Public Interest (CSPI), a non-profit watchdog and consumer advocacy group based in Washington, petitioned FDA to regulate the use of TFAs. While CSPI has welcomed FDA’s announcement, the president of the American Soybean Association (ASA) has questioned the need for this regulation since the processed food industry has already replaced partially hydrogenated vegetable oils, or PHVOs, with blended oils which contain reduced amounts of TFAs or no TFAs at all. Restrictions on the use of TFAs are already in place in some parts of the US. Since 2003, FDA has stipulated that the amount of TFAs be mentioned on food labels because of public health concerns. Ever since, many processed food manufacturers have switched to oils and fats with low TFA content and have reformulated their products. 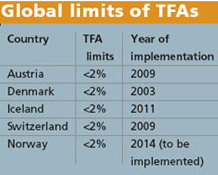 In 2006, New York became the first city in the US to limit TFAs to less than 0.5g per serving in restaurants. Philadelphia in Pennsylvania followed in 2007 to eliminate TFAs in commercial kitchens. In 2008, California became the first state in the US to prohibit the use of oils and fats containing TFAs. According to FDA’s press release, such initiatives have resulted in a drastic drop in the average intake of TFAs—from 4.6g in 2006 to 1g in 2012. However, a large number of food products still contain TFAs. The latest FDA measure intends to restrict this, says Michael Taylor, FDA’s deputy commissioner for foods and veterinary medicine. Naturally occurring trans fatty acids, or TFAs, are present in minimal quantity in meat and dairy products from ruminants. Most of the TFAs are created artificially during the process of partial hydrogenation of vegetable oils. TFAs increase the shelf life of products, improve the texture of food and stabilise the flavour. These features have resulted in partially hydrogenated vegetable oils to be used excessively in our food industry in baked foods, like cakes, burgers and biscuits. ASA has stated that it cannot bring significant quantities of soybean oils which are heart-friendly to the market before 2016. Health expert Marion Nestle, Paulette Goddard Professor in the Department of Nutrition, Food Studies and Public Health at New York University, who strongly opposes TFAs, says the food industry should have expected the ban. FDA had ordered nutritional labelling of TFAs way back in 2003. In India, the government announced a regulation limiting the use of TFAs in June 2013, three years after it was drafted. The food regulatory body in the country—Food Safety and Standards Authority of India (FSSAI)—set a limit for TFAs in oils and fats. It also issued labelling instructions, according to which it is mandatory for all processed and packaged foods to mention the percentage of TFAs and saturated fatty acids (SFAs). The food industry had 60 days to implement this regulation, but according to All India Food Processors’ Association, the time period has been extended till July 2014. 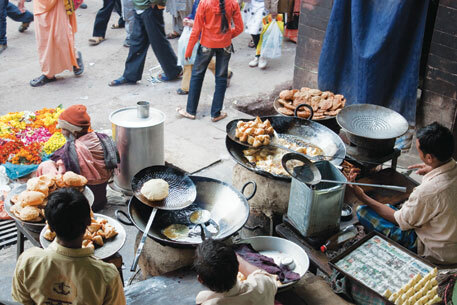 The debate on TFAs in India started in 2004 with the Oils and Fats Sub-Committee, set up by the Union health ministry, observing that the content of TFAs in vanaspati, a semi-solid cooking medium sold in India, is hazardous. In 2008, the Central Committee for Food Standards proposed that limits for TFAs be urgently set. In 2009, the Centre for Science and Environment (CSE) revealed in its study that various fats sold in the Indian market had high levels of TFAs. The study found that the level of TFAs in all seven commonly available vanaspati brands was five to 12 times higher than the 2 per cent limit set in Denmark and other countries. The levels ranged from 9.4 per cent in Dalda to 23.7 per cent in Panghat. After the release of this study, the debate on TFAs again gained momentum. “At a 10 per cent limit, India is far behind the best global practices in limiting industrially produced trans fats,” says Amit Khurana, programme manager, food and toxins team, CSE. FSSAI had drafted the regulation that set TFA limit of 10 per cent (by weight of the product) in 2010. The agency proposed to bring it down to 5 per cent in three years. But the regulation was implemented in 2013 after a delay of three years. Had it been timely implemented by FSSAI in 2010, the TFA limit would have been 5 per cent by now, somewhat closer to the best standards. FSSAI has not replied to queries from Down To Earth. Monika Rawat, Senior Assistant Director, Regulatory Affairs, at the Confederation of Indian Food Trade and Industry claims that the body is taking necessary steps to bring down the level of TFAs in PHVOs from 10 per cent to 5 per cent in the next three years. India is also yet to address the issue of the melting point of PHVOs, which at present is capped at 41°C by FSSAI. TFAs can be reduced by increasing the melting point of PHVOs, which is favoured by the food industry. While this can help bring down the level of TFAs, it is likely to increase the content of saturated fat. Therefore, a fine balance has to be maintained while choosing the melting point. “Timely and strict regulations on trans fats could help control the quality of both standardised packed foods such as fried munchies, chips and biscuits, non-standardised foods such as cakes and pastries, and Indian traditional fried snacks,” says Khurana. A limited presence of TFAs in Indian kitchens and restaurants is bound to have a far-reaching impact on the population, which has high susceptibility to diabetes and heart diseases, he adds.